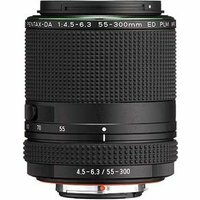 The Pentax-DA 55-300mm f4.5-6.3 PLM WR is a compact, weather-resistant telephoto lens designed for use with Pentax KAF4-mount DSLRs, such as the K-70, K-1, K-3 II, K-S2 and K-S1. It provides focal lengths of between 84.5-460mm when used on an APS-C sensor camera, and has an upgraded AF system that assures quiet, high-speed AF operation, particularly when used with the new Pentax K-70. At just 89mm in length and an approximate weight of 442g, it is entirely weather-sealed, making it a convenient lens to use when shooting outdoors. Incorporating extra-low dispersion (ED) elements in its optics, the Pentax 55-300mm f4.5-6.3 WR Lens is guaranteed to deliver high-resolution, fine-detailed images with rich contrast.